These are well-constructed silk shirts in a classic silhouette that are certain to become some of your favorite wardrobe pieces. This silk can be either hand-washed or dry-cleaned. Easy care instructions on how to hand-wash are included with every garment. 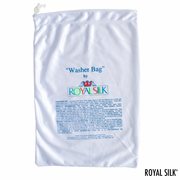 There's even a way to machine-wash this silk shirt with a washer bag by Royal Silk. Royal Silk, widely known for affordable silk elegance, has been making these silk shirts for over thirty years.